First impressions count. We focus on enriching collaborative break out and conference spaces that generate focused, engaged and productive users. We support the design of welcome areas with stylised yet functional furnishings. As today's working practices embrace flexibility, our offices must become increasingly agile. Smart office solutions provide versatile storage and organisation, injected with colour to stimulate productivity. 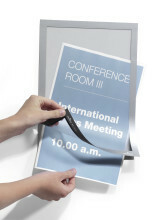 DURABLE'S wide portfolio offers products that can transform all areas of a work space. Desktop tablet holder with a clamp fixing and flexible arm. 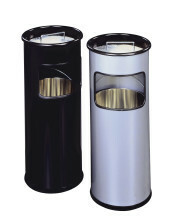 Tablet Holder Floor Stand for use in reception areas, hotels, restaurants, showrooms and much more. Attractive coloured drawer box with 3 slimline drawers makes the organisation of documents easy. Attractive, innovative drawer box with five colourful drawers made of premium-quality plastics. Each drawer is colour coded which aid document organisation. Drawers can be labelled. Suitable for holding A4, C4, folio and letter size formats. Innovative drawer box with 4 colourful drawers. 2 XXL-drawers provide extra large storage capacity. The top drawer is lockable. A compact case for storing tablet & phone charger cables, usb's, pens and other small items of office stationery and equipment. Holds approximately 80 A4 suspension files. With additional shelf. 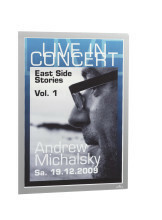 Made of high quality epoxy coated steel. Design curved metal panels with decorative perforated effect. Handgrip on both sides. Dimensions (H x W x D): 695 x 738 x 380 mm. Standout from the crowd with our DURAVIEW® Table, Wall and Floor stands that work great with our DURAFRAME® range. Prod. Code 4904 PICTO "Women's WC"
High quality brushed stainless steel pictograms that impress with their simplicity. 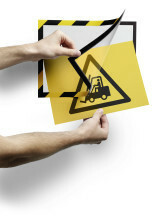 These pictograms can be secured to a variety of surfaces using adhesive pads supplied.They are scratch proof and hardwearing. Prod. Code 4905 PICTO "Men's WC"
Prod. Code 4907 PICTO "WC"
Prod. 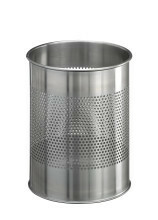 Code 4911 PICTO "No Smoking"
Waste basket, with 165 mm perforation ring, 18.5 litres. Square with rounded edges. Made of steel with scratch resistant polyester coating. Dimensions (H x ? ): 320 x 240 mm. 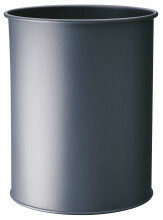 Waste basket, round, 15 litres. 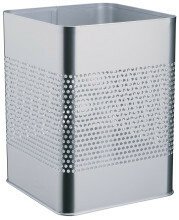 Freestanding, stylish metal bin. Ideal for home and office use. Made of steel with scratch resistant epoxy polyester coating. Dimensions (H x ? ): 315 x 260 mm. Catering Box for flexible storage and organisation of common catering supplies such as coffee pods, tea bags, sugar sachets and more. Space-saving drawer box, can be placed directly under a coffee machine. Transparent drawer insert for sorting and storing cutlery and other coffee station equipment. Practical serving tray for serving drinks or for quickly clearing dishes. Key cabinet for 12 KEY CLIP key holders. Ideal size for a small office or home office use. KEY BOX with combination lock for storing and organising up to 36 KEY CLIP key holders. The combination lock can easily be set to any of 1,000 combinations. Key box with a convenient slot in the lid to insert and store returned keys securely without having to open the box. Medium sized aluminium first aid box with 2 fold-out compartments for clear and easy storage of first aid products. Ideal for use by small businesses. Large aluminium first aid box with 3 fold-out compartments for clear and easy storage of first aid products. Suitable for commercial use - holds approximately 72 first aid components.